Twenty years ago you bought a movie and put the VHS tape on the shelf near your VCR. If the movie wasn’t quite appropriate for the kids, it went into a shoebox on the top shelf of the parent’s closet. That’s where the kids found it when they got a bit older and snooped when the parents were out. Then along came online media purchases and things got more complex. Mom and Dad likely had separate iTunes or Android accounts. Often the kids did too. Movies purchased on one account had to be watched on a device tied to that account. If two kids wanted to watch Frozen on their own devices, some parents bought a copy for each child’s device. Apple, Google, and Amazon have made it a bit easier with shared family plans for the videos and other streaming and downloadable content. 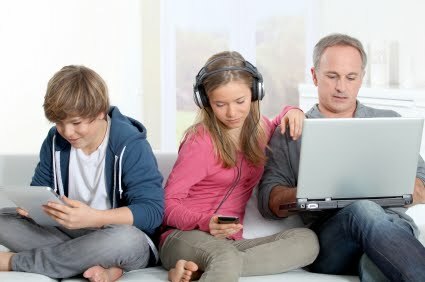 These programs allow family members to share purchases and consume them on various devices, even if the purchase was made on another account, as long as that account is part of the family plan. Apple’s plan has one adult agreeing to pay on their credit card for the purchases of up to five family members. At first, that sounds dangerous, but the kids’ purchases can require the adult’s approval before the transaction is made. This works for both paid and free downloads. The approval is done right on the adult’s device, so the child can make the request while at daycare, and the parent can approve while still at work, for example. The iTunes family program also makes it easy for members to share photos in one album, no matter what device takes a photo. It also creates a family calendar for sharing events. Now a child can post a band practice to the calendar and the parent can see they need to provide transportation that day. And it lets members know where everyone else is by using the location tracking in each phone and showing it on a map. A person can hide their location temporarily if desired. Likewise, any family member can help find another’s lost device. Google’s plan is similar; up to six members, one central payee with parent approval of purchases made on the central card. The approval is not as easy as Apple’s. Parents need to enter in a password on the child’s device. With both programs, not all content is available for sharing. It depends on the content creator. Google and Apple have music programs. For $15 a month, six members can enjoy unlimited streaming of music. You will want to check the cost of data with your cell provider before you opt for this as it is going to be used when away from WiFi. Google’s plan does not automatically create a family calendar or location sharing like Apple’s does, but Google calendar already has sharing you can set up for family, or others. Update: Google has location sharing separately. Amazon Family is a free add-on to Amazon Prime, the $99 a year program that offers free two-day shipping on many Amazon products, and streaming of many video programs. Family offers significant discounts on diapers and other things a family needs. And it offers free time, a service offering children’s videos, apps, music, and books aimed at children. It also have unlimited photo storage, and more than 800,000 free eBooks. And while Amazon does not have the location or calendar sharing of the other two programs, Amazon users can use Google’s services. Indeed, there is no reason to choose just one family program. You can use two or even all three if you choose. Only the iTunes store offers iPhone/iPad apps, but the Google Play Store and the Amazon App store offer Android apps.